There are a number of new features in Corel PaintShop Pro X4. There's the built-in RAW support we've already seen with the Camera RAW lab that pops up in the Edit tab. There are new HDR tools including a batch HDR merge feature similar to the one we reviewed in Unified Color Expose 2. In the file tab, choose HDR and batch merge. A new window opens up and you have to click on Add Files to get the pictures you want. Corel PaintShop Pro X4 will use the time in the EXIF data to work out which pictures are associated with each other. After all, if you're using the bracketing mode, they'll be taken within a few seconds of each other. This is a really neat idea and works very well. It does take a long time to do the batch processing though. We processed 6 image merges (3 images per HDR merge) and it took around 20 minutes to complete. A progress bar does give you an update so you can keep an eye on it. There's a cool miniature feature in Corel PaintShop Pro X4. It's found in Effects, photo effects, selective focus. The program loads the picture into a different window where you can choose the area where you want the picture to remain focused. There are two images, a before and after. 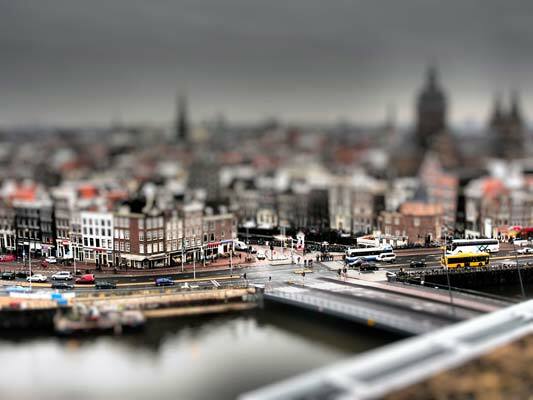 The after shot shows the image with the selective blurring to create the toy town effect. You can move the plane, adjust the harshness of the gradual blurring, adjust the pitch so it goes at an angle you can also choose to force the focus plane to the bottom of the frame. It can be expanded but the blurring gives a similar effect to a graduated filter. There's also a circular option to create a “sweet-spot” just like a Lensbaby. 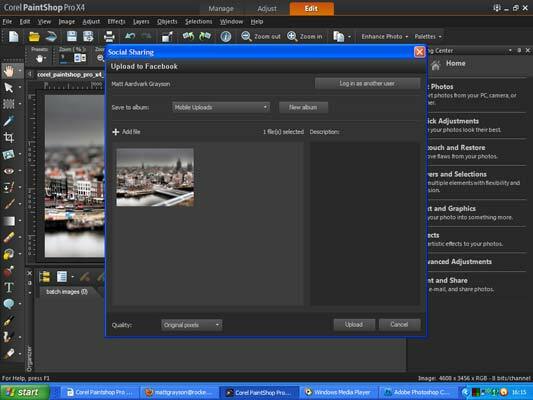 It's possible to share pictures to Facebook and Flickr straight from Corel PaintShop Pro X4. To do this, the Organise pallette has to be open which is found at the bottom of the page. If, like us, you keep closing it, it can be reopened by going to View, Palettes, Organiser. The share button is the fifth icon along the top row that looks like a Flux Capacitor on its side. Clicking on the down arrow next to it will show three options; Email, Facebook and Flickr. The first time these are used, your details will have to be entered and the software recognised. It's a convenient way of getting your pictures onto a Facebook page and Flickr space although we're a little perturbed by the notice that Corel is allowed to access your information at any time even if you're not logged on. To use the program, you have to click Allow. The upload screen is a simple affair adding pictures using the button at the top and browsing through your computer folders. You can amend the folder in Facebook that it will save to or create a new one. You can also adjust the size of the picture to reduce the risk of image theft. A second disc is included in the PaintShop Pro X4 Ultimate box. It holds Nik Color Efex 3, some extended picture tubes and 21 royalty free images from Fotolia. Nik Color Efex is a filter application program. It has a gigantic amount of filters to play around with and some of them look very good. It does run a bit slow in Corel PaintShop Pro X4 but that's probably down to the host program running slowly anyway. However, it's a worthy program and it's a great bonus extra to have in the box. If you enjoy using picture tubes to liven up your photographs then you'll be in your element. There are already loads in the program but the bonus disc adds even more. There's also the chance to download 21 royalty free pictures from Fotolia. You have to use the passkey supplied on a piece of paper in the box. You're only allowed to download three pictures a day over a seven day period. If you don't visit one day, you lose the pictures for that day. There's also codes for a photobook from Blurb which is pretty cool. 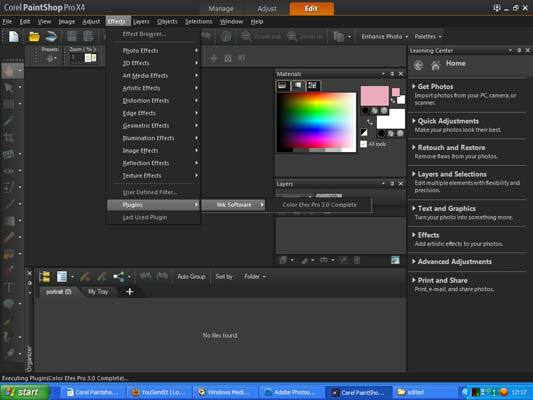 There's no denying the amount of stuff to do in Corel PaintShop Pro X4 is huge. Considering this is a program that will only set you back about £60, it simply destroys all but GIMP in the value for money category of comparable programs. X4 isn't without its problems, though. Despite claimed improvements, it's horrendously slow, something which has plagued PaintShop Pro for years. It's a real shame they haven't managed to address it completely. For example, we had to leave the computer for a large portion of time while it processed 80 RAW files, despite this new version being twice as fast as X3. If you make any adjustments and stop even for a second, the program will update the preview, which wouldn't be a bad thing if it wasn't for the snail pace processing. We like Corel PaintShop Pro X4's worktop design. It's a lovely colour and works well to contrast against pictures making them easier to see. It's a bit cluttered and the icons could be a bit smaller so more could be fitted onto the pallett. 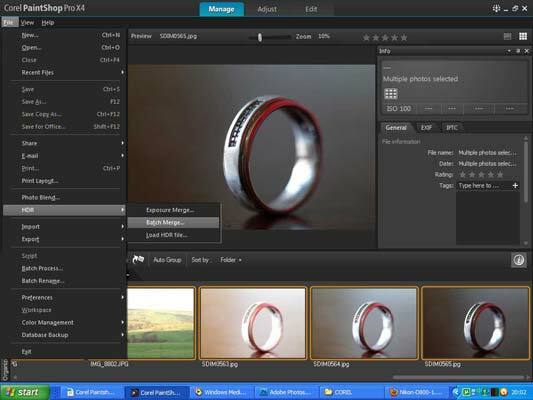 The workflow is good with the import, tagging, basic adjustments and fine editing separated into separate windows. It copies Lightroom a bit with that but that's not such a bad thing. The features in Corel PaintShop Pro X4 work perfectly, we can't fault any of them for the results they produce. We love the added bonus disc in the Ultimate pack. The Nik Color Efex 3.0 CD is great and makes adding filters a lot easier. We like the idea of a photobook and plan to spend plenty of time looking for some pictures to download from Fotolia. 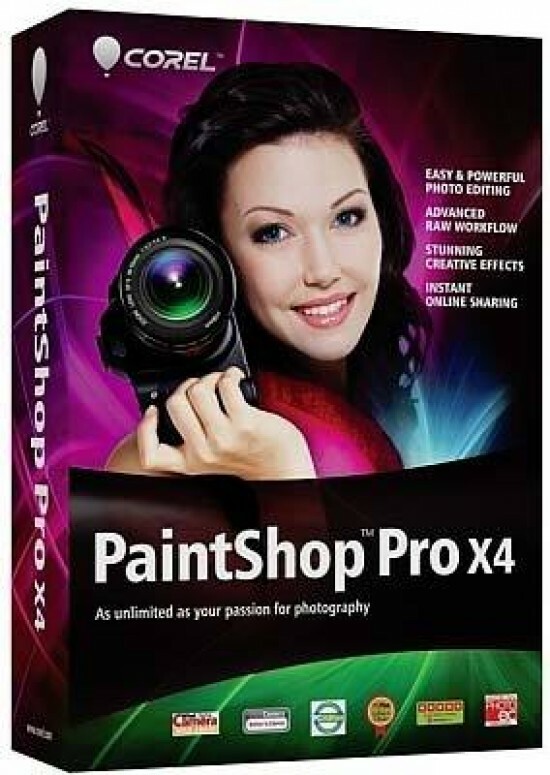 You simply can't go wrong with Corel PaintShop Pro X4 - especially at this price. Sure, it's slow, but for the money you have to take the rough with the smooth. We'd like to see updates that deal with that speed issue though because other programs don't suffer from it. However, if you're in the market for a software program and you don't have hundreds of pounds to spend on Photoshop then Corel PaintShop Pro X4 is definitely one to consider.